During the month of June – 22 July 22- 2018 police of counter narcotics along with other security and intelligence forces arrested 77 people in the connection to 57 cases that include 5 woman and an Iranian citizen from all over the country and their cases are dispatched to Counter Narcotics Justice Centre for further prosecuting . Among the detainees, 19 were those who wanted to transfer heroin-type drugs carrying in their body (swelling) and travel luggages from Hamid Karzai International Airport to India New Delhi; they were identified and arrested by the police and responsible Prosecutor of Counter Narcotics Justice Centre. Based in request of Prosecution Department during the month of June – 22- July-22- 2018 ( Saratan 1397) Primary court confiscated 8 vehicle, 58 different type of self-phone obtained from the smugglers and also ordered the amount of 50185 Afghani currency Cush money and amount of 5050 U.S. Dollar obtained from the smugglers and dispatched to Da Afghanistan Bank . At the same time during the month of June - July 2018 ( Saratan 1397) from the Primary court and Appeal court of CNJC 62 people sentenced to jail from one year and one month up to 16 year in the link to 42 cases of drug trafficking crimes. Police of counter and intoxicating narcotics received from the suspects the amount of 81 kilogram of drug heroin type, 28 kilogram of morphine, 1471 kilogram of opium, 2395 kilogram hashish, 3110 kilogram henbane, 3 kilogram of Methamphetamine, 65 kilogram acid chloride, 24 liter Sodium Carbonate the mentioned substances are discovered and seized that has been found during the arrestments of suspects the detainees are sent to CNJC along with their cases for prosecuting. During the month of June – 22- July-22- 2018 ( Saratan 1397) Kabul province having 20 cases and provinces of Kandahar and Helmand each having 4-4 cases of drugs are at the top of the list of provinces with high-level cases of smuggling and drug trafficking. 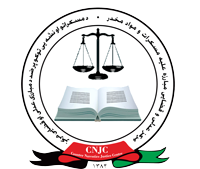 The Provinces of Daikundi, Panjshir, Wardak, Uruzgan, Takhar, Ghor, Bamyan, Kapisa, Logar, Badghis, Zabul, Samangan, Paktika, Nuristan and Bakhtian are among the provinces that there are no cases of smuggling and drug trafficking registered with CNJC. In the course of month May – June 2018, in connection with the 67 cases of drug crimes, 92 people, including 6 women, 1 detainee of public services and a citizen of Iran were detained from all over the country and their cases are dispatched to CNJC for further prosecuting.